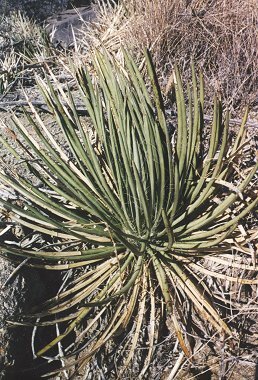 The Shindagger is a small species of agave with narrow, straight leaves which grow to about a foot in length. The leaves have no teeth, but have a sharp point which gives the plant its name. They are able to reproduce by forming new shoots from their underground root system, so you will often see the plant growing in large, genetically identical colonies. The Shindagger grows in southern Arizona and northern Mexico and mainly inhabits desert grassland and oak forests between 4000 and 7000 feet in elevation. The Shindagger is more fomally known as the Schott Agave. 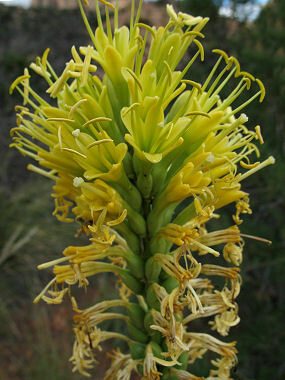 The plant usually blooms in the summer, and like other agaves, produces a tall flower stalk. The flower stalk grows to between 6 to 8 feet in height and bears yellow, tubular flowers, which are followed by woody fruit capsules.